Final Release (two substyles). Supported OSes: Windows 7 and Windows 10. *Changed the window frame borders. May be used as a part of Chronos Desktop! I love all your creations, they're absolutely beautiful...But why not try some different colours? You can recolour skins in the Windowblinds settings. I love all your creations, they're absolutely beautiful...But why not try some different colours? You can recolour skins in the Windowblinds settings. Yes. This is an update with many minor changes (like colors, margins, proportions, etc...) And now this is the finale release. I like this one very much. Big thanks! 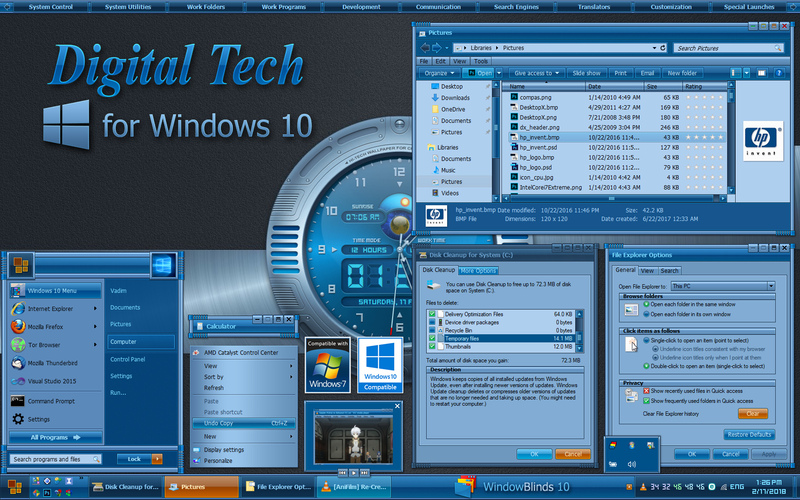 How I can do the same Windows Start Menu like on screenshot in Windows 10? Cause I installed all Chrono stuff and this Digital Tech theme (LaunchBar, Desktop, Weather, Wallpaper) and everything else is works except Windows 10 Start Menu, it's still Windows 10 like. How I can do the same Windows Start Menu like on screenshot in Windows 10? Do you have Start10 installed? I think this software is necessary to change the appearance of Windows 10 Start Menu. I just wanted to say ThankYou.! I'm really enjoying this experience with the wb mainly but, it's also sparked me to try out some more skins in RocketDock & other aspects of my OS experience that have it feeling clean & fresh again.